One of my resolutions this year was to play 10 games from my pile of shame and I cannot believe that I have successfully met my goal with plenty of room to spare. My new goal is to try and check off even more games from my pile of shame and maybe even one day clear it completely. In my first entry I played Abyss and Colt Express, my second entry featured Carrotia and Codenames, my third entry included Just Desserts and Machi Koro: Bright Lights, Big City, my fourth entry focused on Mice and Mystics and Clank! : A Deck-Building Adventure, and my fifth and entry features 7 Wonders Duel and Dastardly Dirigibles. 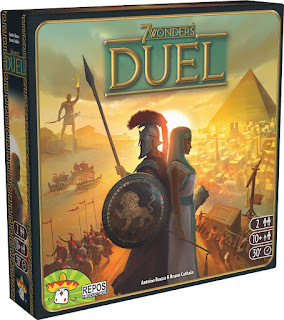 7 Wonders Duel by Repos Production - My wife was kind enough to get me this game as a Christmas gift even though she had no intention of playing it with me. I was worried that it might be a bit too much for my 10 year old son, but after playing it I was amazed at how slick this game is and how it streamlines the decision making process. 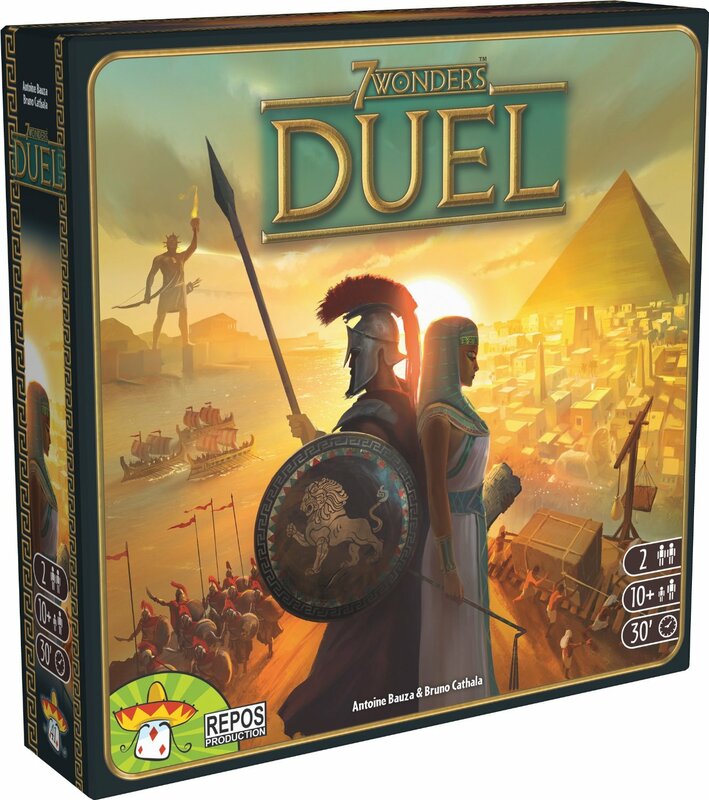 7 Wonders Duel attempts to provide a two-player experience based on the mega-hit card drafting game 7 Wonders. You are competing with a rival city to develop as much as you can over three ages. You are working towards the construction of wonders, while also cultivating a quality of life for your residents with a solid military, investment in the arts, and others. Turns are quick and simply and involve taking a card from the available area, and either purchasing it and building it in your city or cashing it in for gold. In addition to maintaining your city and working towards your wonders, you have to keep an eye on the military balance between your city and your opponents. While I wasn't blown away in my first play through, I immediately wanted to play again to mix things up. It was quick to learn, quick to setup, and offered multiple strategies on the path to victory. Definitely happy to have this in my collection and cannot wait to play it again. 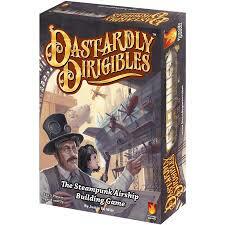 Dastardly Dirigibles by Fireside Games - This is a game all about building your own steampunk blimp in order to score the most points. Game play is extremely simple and this game makes a good filler game or one to play with non-gamer or younger players. The twist in Dastardly Dirigibles is that when you build on your airship, your opponents must build the same part if possible. This can take away from their bonus or potentially provide a bigger bonus depending on the suit. There are few "event" type cards that mix things up a bit more, but in the end this game is extremely light and quite a bit of fun. I don't imagine it will hit my table a ton, but it will be a game that pops out from time to time depending on the group. One nice thing about each round is that you get to marvel at everyone's dirigibles as the game includes some pretty cool art.